IBM has frequently adding new features to Tivoli Storage Manager after they changed its name to IBM Spectrum Protect. The 2 new storage pool types which are Directory Container Storagepool and Cloud Container storage pool types helps us to deduplicate data faster and also backup to cloud. Starting from Tivoli Storage Manager Version 7.1.7, another new storage pool type is added by which you can protect directory-container storage pools by copying the data to container-copy storage pools, where the data can be stored on tape volumes. Previously, you can only protect the data in directory-container storage pools by enabling replication. With this new type of storage pool, you can now copy data from directory-container storage pools to tape to send it to offsite location if required. A container-copy storage pool is a new type of storage pool that provides an alternative to using a replication server to protect data in a directory-container storage pool. Container-copy storage pools can be used to repair minor to moderate directory-container storage pool damage, which includes damaged containers or directories. However, replication is the only way to provide complete disaster recovery protection for directory-container storage pools. With replication, you can directly restore client data from the target server if the source server is unavailable. You cannot create container-copy storage pools if you are using replication. Also Read: What is Directory Container Storagepool ? As per IBM, It is not recommended to use container-copy storage pools for disaster recovery protection, even in a small configuration. Repairing an entire directory-container storage pool, even for a small backup configuration, can take several days. Adding more drives or using the latest generation of tape technologies does not decrease the time that is required for the repair activity. Also Read: What is Cloud Container Storagepool ? Now lets see how to configure container-copy storage pool in both command line and Operations Center by using wizards. 1) To configure container-copy storage pool, you should first define at least one tape library to the server by using the DEFINE LIBRARY command. Provision enough tape drives and scratch volumes to meet your storage requirements. Also remember that Virtual tape libraries are not supported, regardless of which library type is defined. Only physical tape is supported. PROTECTPRocess specifies the maximum number of parallel processes that are used when you issue the PROTECT STGPOOL command to copy data to this pool from a directory-container storage pool. 3) Then you need to define or update the directory container storage pool with the container-copy storage pool to be used for protection. You need to update PROTECTLOCalstgpools parameter with the copy container storage pool name which you defined earlier. This will help you to automatically schedule the protection. PROTECTLOCalstgpools parameter specifies the name of the container-copy storage pool on a local TSM server where the data is backed up. You should update this parameter with copy container storage pool while defining the directory container storage pool. This container-copy storage pool will be a local target storage pool when you use the PROTECT STGPOOL command. 4) Next you can define a schedule, or use PROTECT STGPOOL command to manually protect the data in a directory-container storage pool by storing a copy of the data in the container copy storagepool. On the Operations Center menu bar, click Storage > Storage Pools. On the Storage Pools page, select the directory-container storage pool that you want to protect to tape. Click More > Add Container-Copy Pool. Follow the instructions in the Add Container-Copy Pool window to schedule protection to tape. Note that to copy the data in directory-container storage pools to tape, the Operations Center creates a schedule to run the PROTECT STGPOOL command. When the protection schedule runs, one tape copy is created. At least one volume must be available when the protection schedule runs. Otherwise, the operation fails. 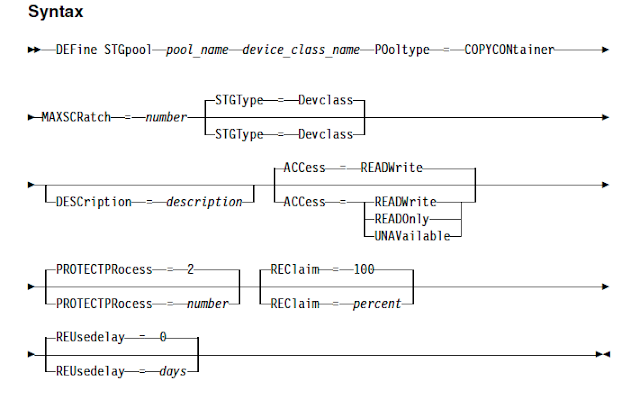 If you created a container-copy storage pool as part of the Add Storage Pool wizard, you do not have to use this procedure. When you completed the wizard, the Operations Center configured the container-copy storage pool and a protection schedule. Check the below video to understand how to configure Container-Copy Pool and define a schedule to start protecting data in directory container storagepool by using OC wizards. 0 Comment to "Protecting directory-container storage pool by using new type of copy storagepool"